It's been about a week, and I have been doing the FlyLady's babysteps. Bless her heart, but I really need to take her daily baby steps about 3-4 a day so I can get this cleaning ball on the move. 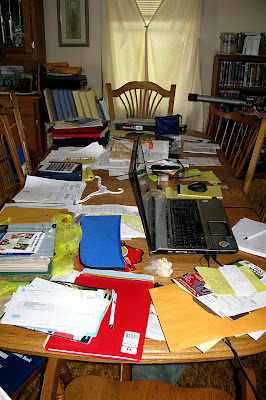 Many of you have been concerned that I will put too much time and effort into being clean, but have no fear. That bone is NOT in me, but after a month of harvest and life on the fly, it is time to take control of my house before it controls me. That's kind of the FlyLady's mantra. We get too hung up on perfection. She encourages her readers and followers to take things 10 or 15 minutes at a time. It's kind of a "Gitter dun" attitude so that cleaning does take up or consume your entire day. 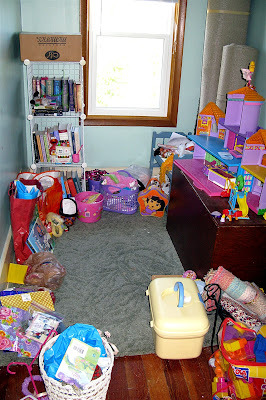 Here was the sad state of the girls' room. Mind you this is Round 1. We are not done, but we did a general keep, donate, store, sorting and trash throwing and folding and putting away and.. well you will hopefully get the idea. I can't believe I am showing you this. Hope Mom is NOT reading today! 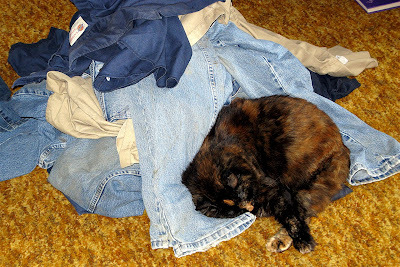 Holding down the laundry so it won't run away! Ok, Still love me? Guess I have to keep it honest, and I know there are just a few people out there that might find encouragement in this post and try to tackle their piles one at a time. My kitchen sink still shines, and it has every night for about a week. It's also spread to my bathroom sinks, mirrors, and toilets. So bit by bit, day by day, things are starting to look a little better around here, and I feel better too. Wow!!! What a difference you made with tackling those jobs! And I love that you are taking it slow and one step (room) at a time! You will get it all done and your house will be fabulous! Way to go my friend!!!! Thanks for being willing to share the photos that the rest of us are to coward to! 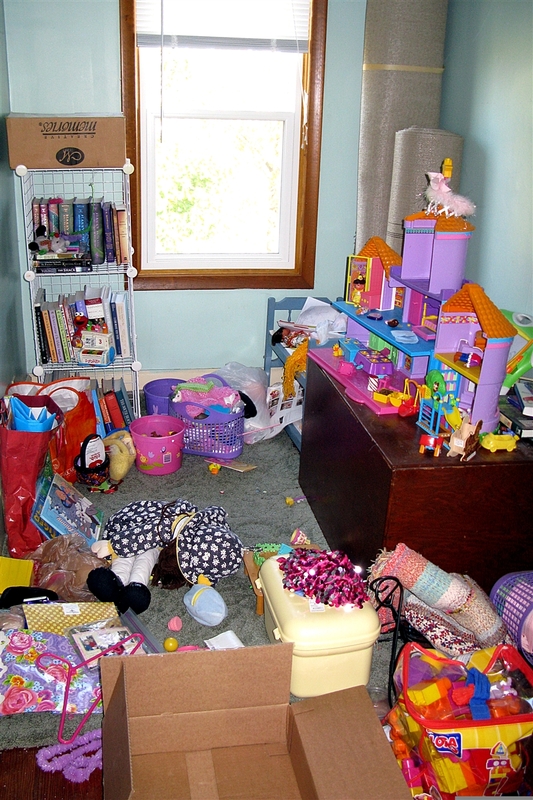 If our kids didn't have so much STUFF their rooms wouldn't end up in that situation! Happy cleaning!! 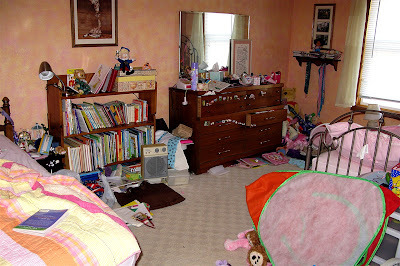 At least you have kids to help clean, it's just me at our house and i usually only clean the rooms that company would see, so bedrooms don't usually make that list. Looks good though. BUT--no matter what, it is looking good and I am proud of you!!!! Way to go Lana! You are brave for showing those photos. I'm so glad you are feeling like you are getting things under control. Isn't "out of control" the worst feeling in the world? I'm cheering for you!! Psstt....My sink is shiny today because of you...thanks!! Oh Yes Betsy, they were both there the entire time. I kind of supervised and guided, and they did most of the put away and pick up work. Both girls were pretty good about it, and they liked the end result. I think an allowance is in their future once Tall Guy and I work out all the ins and outs of it. If it makes you feel any better I would have to clean my house up quite a bit to make it look like your "before" pictures - so you are doing awesome! I have read the FlyLady babysteps before and I am with you, I want to take them 3-4 a day! The concept is a great one though! Hi, I found you through Meet Me On Monday. I am currently in the process of cleaning up my house as well...Things sure do pile up don't they? Slowly, very slowly, I'm getting there! Keep up the hard work. A clean, organized house is so much easier to keep up with. Lana, your lucky-I can still see the floor, there has been times I couldn't in the boys room. The most painful thing is to step on a Ertil tractor in the dark(why couldn't they make those #$%@ out of plastic). You sparked me to do the sink but the Linclon tech recuiter is sparking J to clean the corners out. Why does someone that has never been here,never will be back and doesn't care send us in to high gear cleaning. If it works I can send the recuiter to your home. You inspire me to get back on this when we return home. I laughed at the Before pic of the girls room. You ain't seen nothin' Honey!! 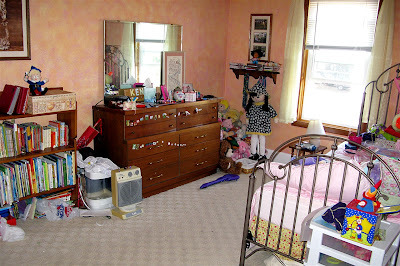 Our 22 year old son is still at home and I will just have to take a pic of that room. It would make your girls grin from ear to ear! Keep up the good work. I hope to join you when I return. I so need to do this! wow, you have been working really hard--looks great! Hi Lana, :) Thank you for stopping by my blog. You are lucky to have the girls closer in age. I find that my 8year old isn't too interested in playing with a baby lol. Your before and after pictures are fun, what a great idea. High five on not being too scared to post those lol. :) We watch home makeovers don't we. I guess the pics are kind of the same idea.. I will be stopping by for more pics :) Take care ..
See I told you it would not be TOOOO painful sharing..... I am getting there on my room and plan to share another IN PROGRESS report and pic. New friend from the hop !!! lana, i am soooo proud of what you have accomplished!! we've got a long way to go, but just think how many bags of trash, donations, recycling, and empty totes we went through. you found things you forgot you even had! you're doing an awesome job!